As my blog title notes, it’s about ‘Life on the Big Island of Hawaii.’ Well, one aspect of life here is that, once in a while, one has to go to Oahu. Medical emergencies or serious illnesses often involve trips to Oahu’s bigger facilities with more specialists. In addition, some government agencies only have offices on Oahu. My recent trip was for the latter reason, but since I had time to spare before my return flight, I took the opportunity for a wander around downtown Honolulu. 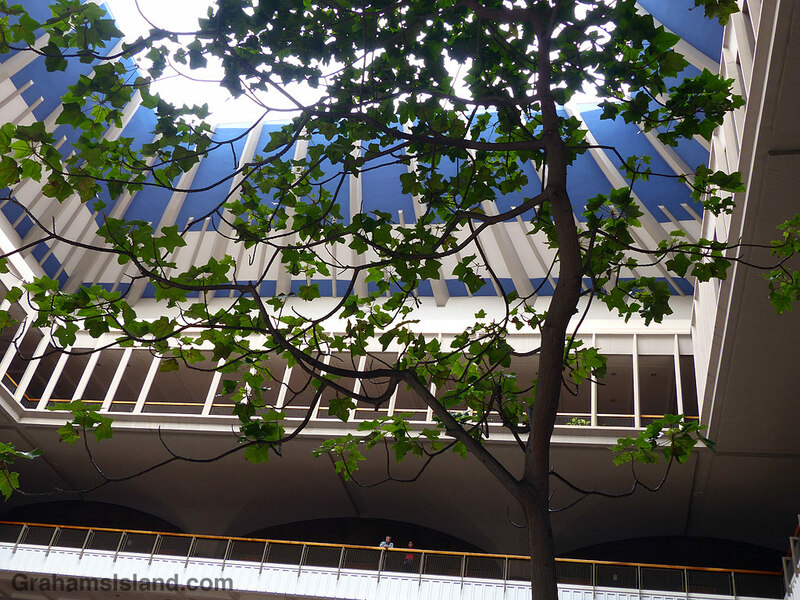 This photo is a view from the central atrium of the capitol building in Honolulu. I happened to be there during a 5-day recess of the legislature, so the normally crowded space was sparsely populated. In the photo, two indistinct figures lean against a rail on the third floor, appearing dwarfed by one of four kukui nut trees (the state tree) and the mass of the building.